Thanksgiving is a dinner holiday. It is all about sitting down and gathering around the table. If you are more of a casual diner the rest of the year, Thanksgiving is a great chance to really go all out. 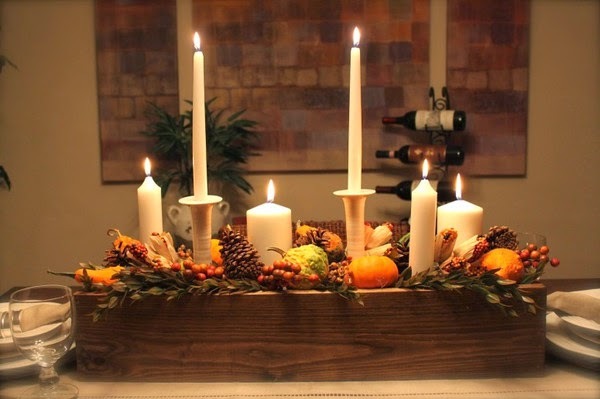 Setting a luxurious table for guests can be easier than you think. There are some basics to remember - start with the dinner plate, top it with a salad plate and folded napkin. TO add a little drama, you can put the napkin between the dinner and salad plate. For a basic silverware setup, the fork goes on the left, then the knife and spoon go to the right of the plate. For glassware, the wine and water glasses go on the right above the plate. If you are going to set a bread plate, it will go above the dinner plate to the left. You can wait to bring out dessert silverware or place the dessert fork and spoon directly above the plate. 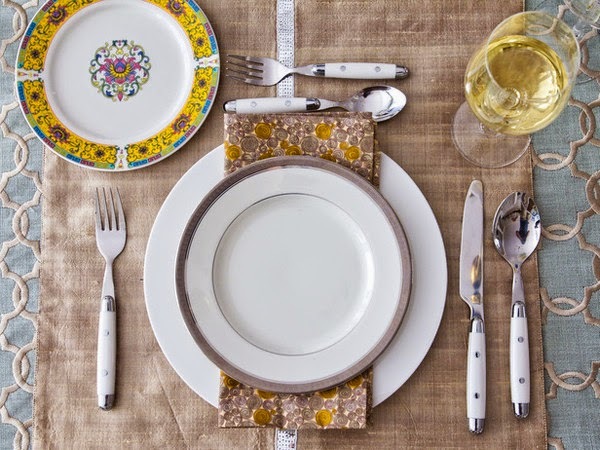 Another thing to consider with your table is skip the placemats and add a runner to the table. You can combine a table cloth made from a luxe fabric with a natural fiber runner to create some contrast and some visual interest. Oh, and you might want to put some food on the table. I turn to the great information the Food Network has for Thanksgiving and the yummy cocktail recipes from Food & Wine. What's On Trend for 2014? There are a couple of key trends that people have been talking about. Taking a cue from the fashion world and reacting to be opposite of the existing trends. Interchangeable Accents: Instead of settling on one fixed look, people will opt for chameleon decor. Starting with a neutral palette, having a versatile neutral base means you can use big-impact accents to easily change up a room or mix up a trend. Lighter woods: Maybe as a reaction to all the dark tones and other rustic woods we’ve been seeing in furniture for so long. Furniture with lighter, honey-color woods will start reappearing and taking center stage. Woods such as walnut, oak, and cherry will add that fresh touch. A Bit of Glitz: After the strong industrial and rustic look, people are going to start thinking about glamour. Sparkle is going to make its way back into living rooms and bedrooms. You will also find it in unexpected places like the kitchen. Floral Blossoming: Although floral and chintz fabric are staples of home design, the return to vintage means old-school designs are making a comeback. Vintage prints and modern takes on floral classics will emerge in the Spring. 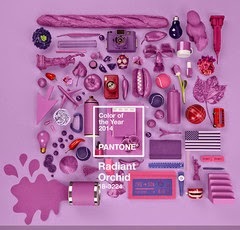 The Decorating Blues: Although the color of the year is Radiant Orchid, you will be spotting blue hues. From navy toteal, the design community is still infatuated with this every so classic and functional colors. Ever since Prince William and Kate got married, we have been seeing more British Influence in design. I am sure that the success of Downton Abbey is a contributing factor to the British pieces of décor as well. Modern British design is a great combination of contemporary piece with warm, rustic sprinkled in there. It has a nod to the tradition of wood and time-worn pieces mixed with sleek lines and styles. As with any trend, you might not want to go whole hog, or maybe I should say Full Monty, but Flaunt your love for our friends across the pond with this charming Union Jack stool.Whether you put it in the den, study, or bedroom, this stool adds a global allure to any space. 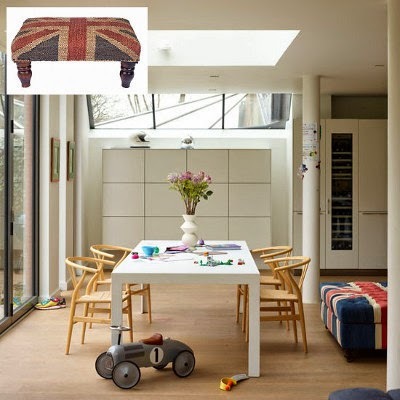 The Union Jack is so recognizable and can be found on so many items. Design Sponge even wrote an article about it call Union Jack is the New Black. Heck, even Home Depot wrote about the Union Jack as a design trend. With such classic colors as dark blue, deep red and white, it can be integrated into almost any decor depending on the material of the object. Not sure you want the Union Jack in your home or you don't want to let your love for all things British stop you there. Check out the new Constable Button necklaces from Smitten. It will add a 'proper' touch to any outfit. There has been so much buzz about Ikat designs in the home décor and textile community. These exotic fabrics have a motif with ancient roots, but new colors give it a fresher look that can energize furnishings and accessories. Above and beyond the visual interest of Ikat, there is a long and interesting history dating back to the 10th century. Elle Decor did a really great piece about the history of Ikat that you can check out. Reclaimed wood can be used in a number of areas of the home including flooring counter tops and décor pieces. Urban Cottage carries a line of products from a local company called Reclaimed Things. Reclaimed wood isn't as convenient to buy as wood from the home supply store, but nothing can matches reclaimed wood's uniqueness and character. 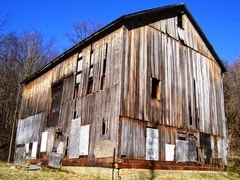 A lot of reclaimed lumber comes from old, rundown barns that are no longer in use. However, reclaimed wood can be anything made from a wood products. It might be something in your home like an old banister. According to Chad Beatty, vice president of Elmwood Reclaimed Timber, there are some good arguments for using Reclaimed Wood products for projects. 1) It's environmentally friendly. Reclaimed wood isn't grown on farms. Yes, it represents a tree that's been cut down, but at least it's getting another life in your home. 2) It has an age and character that cannot be mimicked. Aging also brings out the color in the wood. 3) Most old-growth wood is no longer available because many species cannot be harvested due to regulations. 4) Reclaimed wood has its own history. The counter top in your kitchen might have had a previous life as a barn in Sunbury, PA. There are so many ways to use Reclaimed products and sources, and I listed a few of them for you to check out. 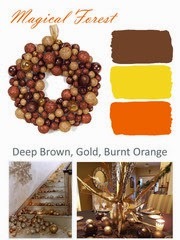 In home décor, there is always a lot of discussion about color and pattern. However, over the past few years, there has been a lot of talk about Reclaimed Wood. With many new products coming on the market, I thought it might be nice to take a quick look at the topic. Bird motifs have been popular in design for years. There is a category of home design called Aviary devoted to all things with a Bird on it. If you have been in the store, or even looked at the logo, you know I like birds. Some of my favorite products in the store have our feathered friends on them. Why? Bird Motifs add a beautiful, nature-inspired element to a home's interior. They lend themselves to a variety of design styles, and are easy to incorporate into an existing decorating scheme. Birds are found on everything from clocks, to light and lovely fabrics and linens, artistic print trays and fun decorative bird accessories. 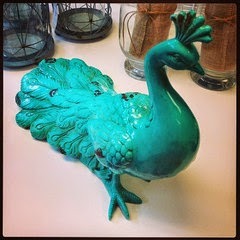 Last holiday season, we used Peacocks in our holiday decorating scheme - Urban Holiday. The array of colors in the aviary world means that you can find something in nature that can inspire your color scheme in the home or coordinate with the palette you have already chosen. You could say, it will let you imagination take flight. In an era where 'craftsmanship' is taking on more importance, we are seeing time-loved and custom built pieces become more important in our home décor mix. The trend is about giving a nod to our ancestors who lived in basic rustic wood structures with hand made furnishings, rough cut woods and 'livable' surroundings. 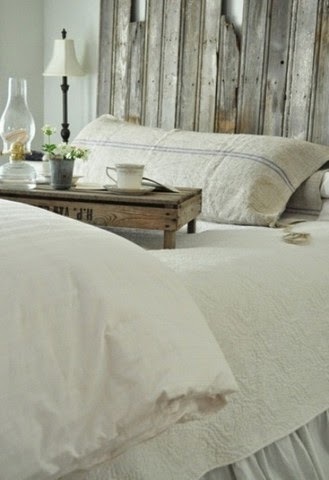 There is something about the simplicity of rustic décor that lends warmth and goodness to any room. As a store in the Rustbelt, we often have cold and dark winters. Creating a home that is a warm, comfortable retreat can help us make it through a long stretch of Northern Winter weather. It also allows us to have a place to get away from the grind of daily life and imagine we are having a 'weekend' getaway at a luxe cabin. A couple of weeks ago, I wrote about Reclaimed Wood and how it is a growing trending. One of the drivers of that trend is the resurgence of Rustic décor as a home design trend. Although Shabby Chic has been a strong style for the past decade, it seems like home owners and apartment dwellers have finally figured out that timeless, classic rustic pieces can create a cozier home. It is a style that can be easily combined with other styles because it straddles industrial, shabby chic and vintage styles. ma, but baskets are still one of my favorites. There are a lot of different places in the home you can use baskets. Baskets are also versatile and can coordinate with any style. They also come in a wide variety of shapes and sizes to fit any space where you might need them. At Urban Cottage, we use baskets throughout the store to display and keep everything from hooks to pillows. 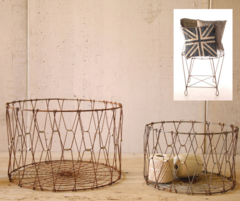 We recently got the incredible folding wire baskets pictured at the left. The come in so many sizes, will match a multitude of styles, and will fold away when you are not using them. I don't know why you wouldn't be using them, but it could happen. Why not jazz up those boring thumbtacks? Get out that hot glue gun. Round up any buttons you have around ('cause you know you do). Just hot glue buttons on top of the thumbtacks.I recommend pairing up the curved or indented parts of the buttons with the curve of your thumbtacks if they don't have a flat surface. Now they are cute as a button! 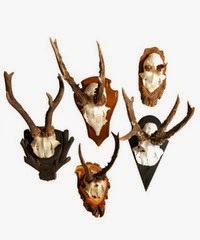 Whether you want a rustic, cozy feel, or you are aiming for the English hunting lodge look, antlers are a wonderful accessory for either style. Very few accessories can achieve a look that is both rustic and elegant. In recent years, antlers have gone from being used in elegant manors in England, to being found in contemporary restaurants to add a bit of history and flair. You can use antlers as decoration, or add a practical purpose as a set of hooks in an entry way or way to hang your necklaces. Paired with natural fibers, like the wallpaper seen in the photo, they add a contrast to refined style that really works. You do it. You know you do. You take tons of photos on your digital camera or cell phone camera, but then never do anything with them. You might text one to a friend or post it on social media. However, most of those pictures never see the light of day. Why not turn those photo into memories by printing and framing them? It is so easy these days to print photos. You can just buy photo paper and do it at home. Don't have a printer, all the pharmacies have machines that will do it. To lazy to go to the store, just download a phone app that will print and mail the photos for you. Just search for Photo Prints in your App store for Free apps. 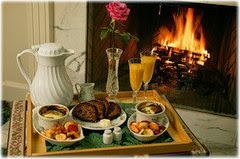 There is nothing like having great memories of special moments or every day fun around in your home and work place. 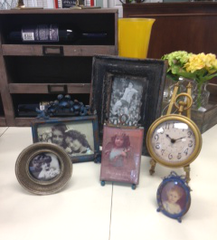 Pick a great frame that is fun and reflects the moment, your home décor or your personality. They also make great gifts! There are so many trends, and they change so quickly. That means I read of a lot of magazines, blogs and websites to keep on top of changes in trends and discover unique ideas. I not only get my information from traditional sources like Pantone, HGTV or House Beautiful, but a whole series of other blogs that inspire me. This week, I thought I would share a list of the tops one that I read for enjoyment and to find inspiration. Style At Home - this website is chock full of great decorating and organizing tips. I also like that they translate high end ideas into affordable comparisons. 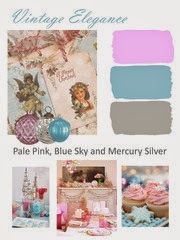 The Inspired Room - as the blog says, she provides "simple, and doable ideas for loving your home"
Of course, another great place for inspiration is Pinterest. Our Urban Cottage Pinterest Boards are filled with home décor, inspiration and other great products to compliment our home. Summer is finally here. You want to enjoy every second of it by making the most of your outdoor space. Whether is a great patio, a small balcony or a patch of grass, you can make the al fresco spot feel like home. Add a personal touch with a few items like whimsical chair cushions, candles or some overhead metal lanterns for those long evenings. You might want to drink some nice wine on a summer night, so get some special ones for the summer. Even better, treat your glass of water or lemonade to a pretty glass. Spruce up the table with some new linens and fun pillows - now your summer is not just going to be hot. It is going to be Haute! Do you remember the days when you took photos, sent the film into so strange location in Seattle and then 3 weeks later you had photos. Oh those days are gone, but the nostalgia and wonderful design of those cameras is a great way to add to your décor. Since vintage cameras come in all shapes and sizes, you can get ones to coordinate with your colors. You can even go with classic black cameras . . . because black goes with everything. Whether you place it on an end table, frame the cameras on a wall as individual pieces of art or group them on a bookshelf, you can find a design that 'clicks' with your style. Are you a photo-lover? Use them as table décor for your wedding. They are great for table numbers or just to add a little bit of flair. If you want to be 'social' with it, post your #hashtag for guest to use for any digital pics they might post. Instant wedding album - and no waiting 3 weeks! In the heat of summer, we start to think about cooling off. Maybe you think about jumping in the lake or going to the beach. There is something casual and relaxed about the beach house. You can bring that feeling home with some nods to summer style in your home. Most people think of the time honored rustic tradition when they think of the beach. There is nothing more inviting that something that looks well-loved and time-honored. However, you can always get something that is nautical and more modern to add that sea-drifted feeling to your home. A sleek aluminum sail boat might be just the right touch. Bring your lanterns inside as a design element. Although you can place them on a table, hang them for a totally different feel. It will instantly add a dash of nautical. With so many styles of lanterns, you can seamlessly make it part of your décor. There are so many things that you can do at home, but without a lot of power tools and time, you have to be pretty selective of what you are going to tackle. These few posts were great for DIY projects and something you could take on over the weekend. Last week a customer came into the store to buy some frames for her wedding. I had seen people put photos of the couple over time - when they were kids, high school graduation and other pivotal moments in time. However, she was going to frame all of the photos from her family members including parents, grandparents and great grandparents. I had never seen that before and I LOVED the idea.What a great way to honor your family on your wedding day. 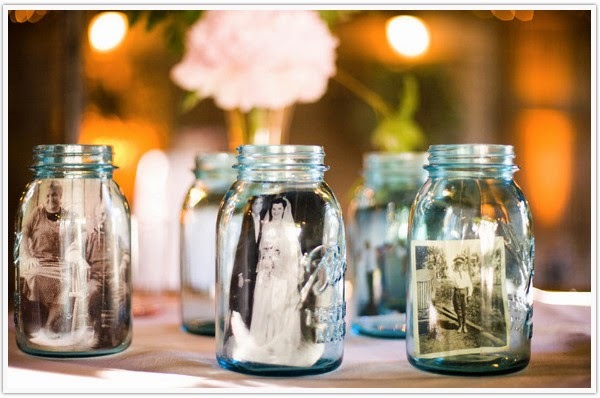 Later that day, I stumbled across a blog post on Camilla Styles blog showing this clever way to use mason jars for photos. Front and center was a wedding photo! 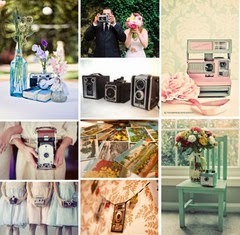 What a fun way to do this for a more vintage or rustic wedding. Smart, fun and easy. The great thing about this idea is that you can use it in so many ways. A birthday, a reunion or a family picnic. Of course, you don't have to wait for a special occasion, you could incorporate this look into your every day décor on bookshelves or in the kitchen. When you have a lamp that needs updating, a simple change is a great new shade. However, the shade can end up being one of the most expensive parts of a lamp. I decided to do a quick fix to get an affordable white shade and try out some styles without a huge commitment or hit to the pocket book. I got a plain white shade from Ikea (yes, I still shop there even thought I own a decor store). They were about $8. In order to jazz it up, I got some of that patterned duct tape from 3m. There are lots of brands who make it. As a matter of fact, the company Duck does an annual prom dress competition with the stuff . . . it's where I got the idea. First, you are going to apply 6 diagonal strips. 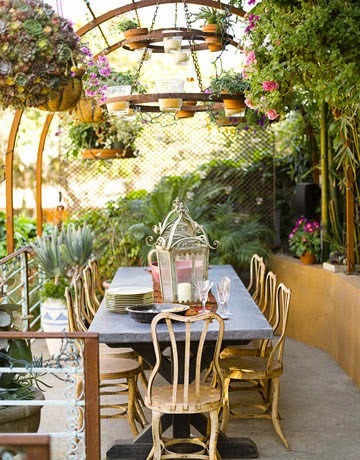 Start each strip over the top of the shade to the right of the metal form that holds the shade together. Run the tape at approximately a 40 degree angle to the bottom. After you measure, leave a bit before you cut so you can tuck it under the shade. My shade had 3 spokes in the circle at the top, so that is why I picked 3 stripes as a starting point. It is easier to use something on the shade that is already measured for you. Next, measure halfway between each tape strip and apply another strip like you did the first. This should give you a total of 6 strips around the shade. You could just leave the shade with the stripes, but I wanted to add a bit more interest to it. To do that, I decided to add criss-cross stripes. To do this. start at one of your current tape strips. Cover the entire width with you tape, but the angle should be pointed in the opposite direction. Run the strip to the bottom of the next strip over. This will give you the exact angle you need. Repeat this step 5 more times until you have a total of 6 stripes in that direction. That will give you a grand total of 12 on the whole shade. Now you have a styling patterned shade. You may or may not want to live with this shade long term, but what you can start to do is look for something that you can buy. Once you know you like the design, it is worth the long-term investment to buy something that will last over time. Dazzle Dad with Something Special! The weather is getting warm, and there are a million things to do. Sometimes that means, we don't give a lot of thought to our Father's Day gifts. With all that he does for us, wouldn't it be great to dad something special. It is pretty easy to get the standard gift, but there are some easy ideas for dad. Does he have a man cave? It is always fun to get him something for there. Does he like to cook? How about something for the kitchen. 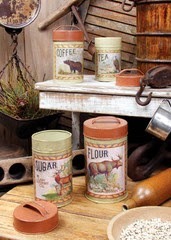 Personally, I love these country cabin canisters because they can cover both bases. Use them in the kitchen... or hide desk items and remotes in the Man Cave. The rustic design with big game on it strikes the perfect 'manly' chord for either place. Another great area for getting him something special is the desk. Dad might not be a 'nick knack' guy, but something fun and useful for the desk will be a hit. This dog pencil/pen cup holder is one of my favs. Not into dogs, try out durable Field Notes products. Tough notebooks to survive the garage, car or office. It is great to think out of the box. Even better, just give him something from the heart. It is the best gift of all. We have all had this problem - extra seating at a party or gathering. Yes, you can drag some chairs in from the dining room or put our some pretty horrible wooden folding chairs. However, what do you do when you want to have some extra seating in your house and you want it to look a bit more swank? I got the idea for this project when I noticed these great folding chairs. Yes, there were a very ugly goldish color. They were also covered with a nasty looking vinyl fabric. I am assuming they had been used for decades in a local fire hall or church, but overall the design of the chair was pretty decent. 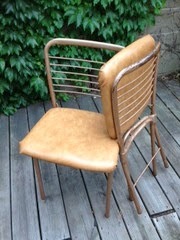 The curved back and wire ladder back gave the chair a pretty decent shape. Best of all, these things were sturdy. Made in the USA and meant to withstand the ongoing abuse of drunk people at weddings and graduations. These were prefect. First, I had to decide on a color. I didn't want anything too pretty or just plain. I branched away from my regular Rustoleum because I didn't plan on leaving them outside. I tried out Valspar from Lowes in a color called Silver Fox. It is a nice grey-toned blue. Since I had originally thought of using silver, it was a great compromise. I gave it a coat or two to make sure I had hit all of the railing and sides of the chair. Since this will fold up, you really see underneath the seat and the legs, so I was extra careful with these areas. I took the chair apart and spray painted the chair and the base of the seat with the Silver Fox paint. These chairs were a little tricky because you really have to pry open the seat to get at the fabric. Next, I picked a pretty heavy duty upholstery fabric for this job. The stripes are classic and the browns and greens are very easy to coordinate with may styles and designs. I have used this fabric before and it really integrates well. 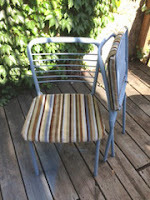 Unlike most chairs, the bottom of this was metal, so I was not able to staple the fabric directly onto the seat. I had to be a bit more imaginative. First, I tried some adhesive spray. That didn't work. Next, I just used good old-fashioned packing tape to hold it into place while I put the metal seat cover back on it. There were prongs on the seat that folded down to hold it into place, so I lined those up, and pushed the metal cover back on. It took a few taps with a hammer to get it back on and securely on the bottom. The real security comes from mounting brackets that attach to the chair. Voila! I had a finished chair. It looks so much better. It is something I can put in the closet, but they are so cute, I can just tuck them in a corner to even use them for every day. For now, I think I am going to use them to put outside when I have events at the store. We always need a little bit of extra seating toward the end of the night when people are gathered outside. Ok. If you go back and read the title of that song to the harmony of the opening of Chain of Fools . . . it will be a lot more interesting. However, that isn't really the point of this blog post. 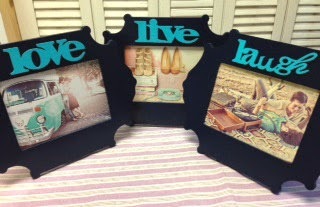 Cute and personal frames are, and yes I did a set of three of them. It was a really fun project, and super easy. Although there were 'finished' frames, I always like to give them a light sanding. For these, the edges often need a little extra TLC to come out looking smooth. Next, I took the frames and put them on the painting table. This table is outdoors and covered with any paint known to man. If you are using a table you can't get any paint on, make sure to put down news paper or a drop cloth to keep your table or painting surface clean. For this project, I chose to make the frames dark blue. I always use the Rustoleum Ultra Coat Spray paint because it has great coverage. A project like this needs one good coat and a touch up coat. In warm weather, it is super fast. First, I painted the back side of the frames. That way the finish could get a little touched when it was flipped over, and it wouldn't impact the look of the project. I also spray the sides of the frames at this point. After doing touch ups, and the back is dry, flip the frames over and do the front side. I always make sure I do at least two coats even when it just looks like it need a touch-up in one spot or two. If you don't coat the 'touch up' coat on the whole frame, it can come out looking uneven. Next, I got a set of wooden cut-out words. I took these and sprayed them with a different color. For this project, I used seaside. I thought the teal looking color coordinated nicely with the navy blue. However, the color was light enough to jump off of the frame. A little bit about color selection. For this project, I had some photos in mind. The inspiration for the seaside came from a one of the photos. 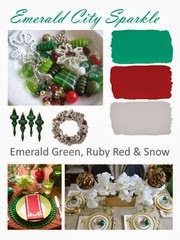 Since you are able to customize this project, use the photos you selected as the inspiration for great color combinations. 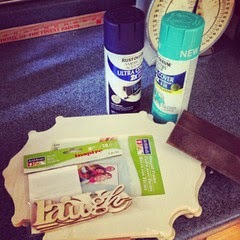 After I sprayed each of the three wooden words that I had, I attached them to each of the frames. I made sure that I knew the center point for the frame and the center point for the word. Just use a ruler, measure and divide by 2. You can make a mark, but I just leave the ruler by the frame when I am putting it on. 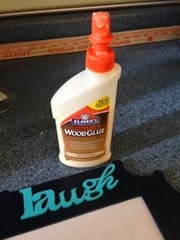 Wood glue is a great product, but it can often run off the smaller wooden words. To prevent it from running off, I used a foam brush (you can use any brush) and applied it like that so it would have a clean finish. Next, I waited for the the wood to dry and cut the photos for my project and put them in the frames. If you have the kind of entry way that gets cluttered, there are a few simple things you can. An entry table is great. Make sure to put a container to drop your keys. Another easy idea is a hook board. It is a great place to stash umbrellas and coats - especially this time of year when the days change from hot to cool over night. I created this fun hook board to do the job. You can use any board, but I got this one precut for $3. Next I used Heirloom White Spray paint. I distressed it a little bit, but not too much. After I painted it, I measured to the center for the middle knob. I didn't make the outside knobs the perfect middle distance, but selected something I thought looked good and measure the same distance from the center and bottom. After marketing the location of the knobs, I used the horizontal center line to draw a line 1.5" from the top for my number. With number stencils, I used a foam brush and created the number stencils for the piece. In theory, you can put anything here - names, images - I just liked the idea of numbers. 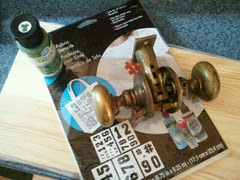 For this project, I had a couple of set of door knobs sitting around. I took them apart and kept the knob and the mounting bracket. Next, I took the mounting bracket and used it as a template to pre-drill some holes for the screws. You can go without creating pilot holes, but the project goes much faster and will be prevent the wood from possibly splitting. After I screwed in all of the mounting brackets, I secured in the knobs with industrial glue to hold them into place. I made sure to put the screw holes toward the bottom so it would look nicer. This is the hard part because I let the glue set over night (it needs a couple hours to really set). Next, I got framing brackets and screwed them into the back of the piece. Afterward, I just threaded the bracket eyes with frame wire and voila. A great new organizational addition to the foyer. It goes by so quickly - doesn't it? Birthdays, graduation or vacations seem to be here and gone in a moment. There is no better way to remember those special occasions than with a lovely framed photo. Yes, we live in a digital age. However, it is still a wonderful feeling to come home after a long day and have the images of life's blessings, favorite places, incredible moments or even postcards surrounding us. It is why we work so hard isn't it? 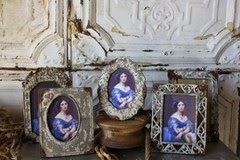 Frames are always a nice added touch to a room when you need some accessories. One of the great things about picture frames is that they come in so many sizes and you can really personalize them. Whether on a table or a wall, you have so many options. There is also a great guide for creating picture wall galleries that we use. Not only are frames a great little gift for yourself, but framed photos are a tried and true present for so many different people. Make a Party in the Garden! The trees are finally green, and the grass is growing - probably too fast! It means that it is the time of year to get outside and enjoy. 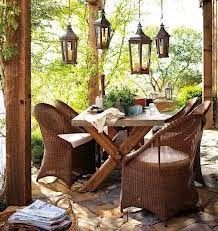 First, you need to pretty up the Outdoor space and get some lovely accessories to sit down and visit with friends. A simple way to spruce up the patio or front porch is with a few new planters. It is incredible how quickly adding a set of pretty annuals in distressed planters, wire plant stand or small flowers in colorful pots adds a splash of character. Once you have the flowers and furniture set, you are ready to have a few friends over and enjoy the weather. 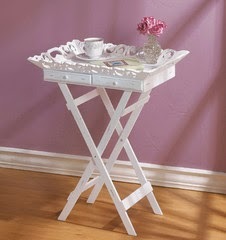 Add a touch of elegance by putting your drinks out on a lovely drink tray. You can use a distressed folding tray to set out cocktail or iced tea. Even better is when you have a couple of drawers to stash napkins so they don't blow away. After all that, just sit back and relax. Enjoy the wonderful weather, and company of good friends. Storage can be a challenge. There is never enough of it and there are so many things to corral - especially in a bathroom. Aside from that, finding bright and interesting storage can be nearly impossible. This week, I decided to tackle this problem with a great storage basket. 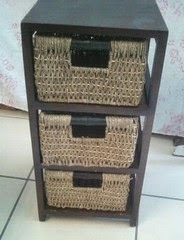 My mom picked up this dark brown 3-tier storage basket piece at a flea market. She is pretty sneaking about what she pays for things, but I think she got it for about $10 - 20. If you would buy a new one at Target or Pier 1, they run about $90 - 120. It is pretty pricey for a small piece where the majority of the construction is sea grass baskets. I wanted to do something, fun and bright that would feel like a spa in an ordinary white and black bathroom. With the brown handles on the baskets, it was definitely a challenge. I thought about painting the baskets, but wasn't sure how that would turn out. I thought any paint might wear off over time. The thought if dying them passed through my mind, but I felt the sea grass was going to be resistant Since I didn't have a sample, this was a one shot deal, so 'testing' was a little out of the question. 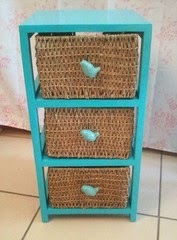 Instead, I turned the basket around and simply put these adorable light green bird handles on the basket. The screw in the handle was made for a door, so you can put it shorter once you install it. Just get a pair of tin snips and remember to sand down the edge so it isn't sharp at all. Next, I took out the baskets and gave the wood frame a light sanding. After the sanding, I wiped off the piece with a damp rag and let it dry. Since it was a sunny day, I was careful to make sure it wasn't too hot for the spray paint to adhere to the wood surface. Lots of sunlight makes for quick drying, but also very little time to correct any drips or mistakes. I choose "Seaside" from my collection of spray paint colors. You might remember I did a makeover on a car planter I did, and used the same color. I have really enjoyed how fun the color is and thought it fulfilled the 'spa' requirement for the project. A quick coat and some touch ups, and I was in business. When it was dried, I put the baskets with the bird handles back in the frame. I couldn't be happier. This kind of sorry looking set of drawers looks happy and fun. It is really going to pop against the white tiles in the bathroom . . . and I will have extra places to stash my towels and accessories. With the big day fast approaching, we're got some ideas for this Mother's Day. And although we know Mom will love with whatever we get for her, some of the best gifts are the ones that help her relax and unwind at home -- because she deserves it. Whether its organizing her jewelry or some serenity in the backyard, we've got a present in mind. We have a lot of ideas to give her that little bit of pampering. The warms afternoons of summer are approaching, and it makes you want to sit outside. There is nothing better than gathering around to enjoy the company of family and friends. Why not get her a lantern for the garden. It might be a hanging version, or something pretty to set on the table like our blue wire cathedral lanterns. Why not give Mom the elements for a relaxing bath. We have eco-friendly spa sets in wonderful fragrances like Orange Ginger, Warm Vanilla or Lemongrass with Eucalyptus. These pretty scents in a lovely basket are the perfect indulgence. You can also show her you care by putting your favorite photo of you together in a great frames. There is nothing better than a personal memory to say I Love You. I have always been a big fan of great lighting. There are so many times I really needed some good lighting to perk up a room. The problem with lamps is that it takes me forever to find something I am really in love with. So what do you do if you need some lighting and don't want to invest in lamps you don't love or that are so crummy you don't want them in your home? Well, I took it upon myself to do a little transformation. I got there yellow lamps at a flea market for $1.00 each. The lamps are a decent shape and are a solid ceramic. That made it a good base to get started. 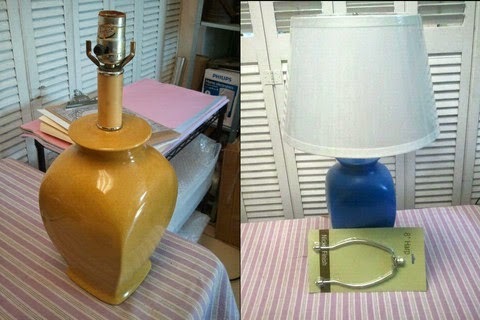 Instead of putting yellow lamps (no offense, but they are yuck) in my living room, I decided to give them a little TLC. First, I spray painted them light blue. That is a color that coordinates with the room, but there are only dashes you can see. I also like the color because it is bright and perky, and the bones of the room (wood planks and brick) are a bit dark. After giving the lamps several coats, I replaced the harps on the light. They were different sizes and the finials looks a bit tattered. For this project, I got a basic white shade and shaazam, they look like new. I am not sure if I am going to decorate the shade with a stripe or chevron, but I will make sure to update this post if I do that! One of the design elements of a room that often gets overlooked are mirrors. 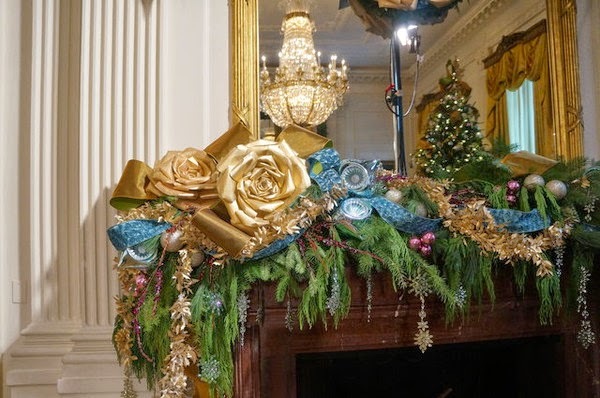 They are a decorative item that doesn't gets much fanfare. They have a wide range of uses including finish material on walls, and as a cladding on furniture. Whether you hang it over the fireplace, by the door for that one last look or place them in frames throughout the room, mirrors can transform a space from small to roomy in a heartbeat. Mirror styles are versatile in that they can represent any décor style, and come in a variety of sizes to fit any location in the home. 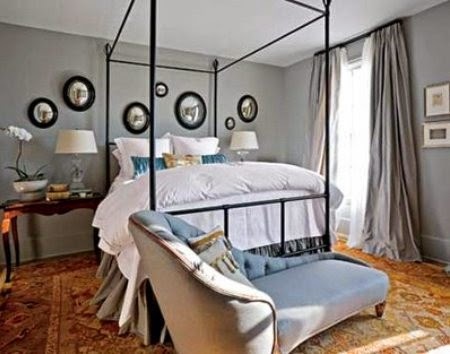 Bedroom full length mirrors can be a simple framed piece on a wall or you can have a bold statement as a piece of furniture. Mirrors reflect light into a space to enliven the décor. The true beauty of mirrors is that they can be utilized in every room of your house, so try using mirrors in the room you love best! If you ever go to flea markets, thrift stores . . . or sometimes just your own garage, you might have some ceramics or planters whose glory days have past. Sometimes these are in the shape of flowers, animal or cars. For this project, I decided to rescue a car planter. Most likely it was a father's day gift with some sort of small plant. The first thing I always think about is how and where I am going to use this. For this project, I would loved to make it a pair of bookends. However, I only had one, so I thought it would be a great conversation piece to add to a bookshelf or mantel. The design of the car is very old fashioned, so I wanted to pick a new and fresh color to give it a more modern edge. You would be amazed how much the right color can transform the feeling of something and help transition it between style. For this project, I picked Seaside. It has that great color you will find on those hotels dotting the beach along the east coast. It is also in the realm of thespunky teal colors that continue to be part of the home decor color trends for 2013. OK, down to brass tacks. 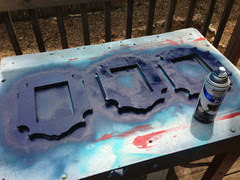 First, make sure the piece is very clean, or your spray paint won't adhere to it. Yes, I use spray paint because of the ability to adhere without sanding. It is also gives a better finish without brush marks. I start on the bottom of the piece. It is important because if the paint doesn't something strange, you can potentially hide it on the bottom and figure out how to fix it before coating the top. Give the piece a light coat. Wait for 5/10 minutes depending on outside temperature and put on a second coat. I love those this came out. You can see that it has a great rustic feel, but lends a pop of color to my bookshelf.